Gallery hours are Fridays, Saturdays and Sundays, 12pm-6pm, for the duration of the show. The show will also be open for the Artwalk on August 14 from 6pm-10pm. 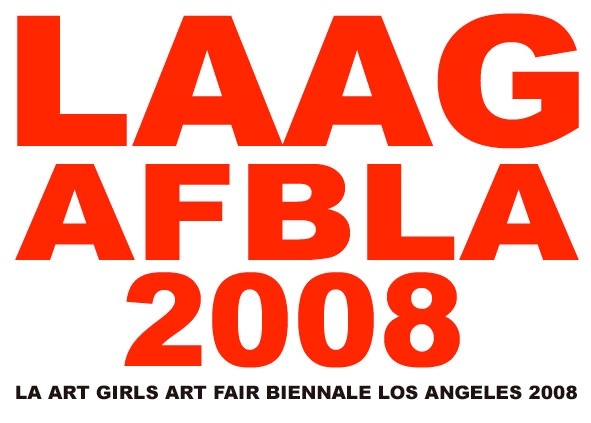 LAAGAFBLA08 is the LA Art Girl’s world premier international art show for contemporary works, and will be Los Angeles’ cultural and social highlight for the summer. The exhibition recognizes the individual within this unique artist collective. Work by 26 artists, from our cutting edge generation of emerging stars, will be contained in two spectacular downtown spaces. The exhibition includes the highest- quality paintings, sculptures, drawings, installations, photographs, and video. This prestigious exhibition combines a selection of top art works with an exciting program of special performances, parties and crossover events. Exhibition sites are located on 6th Street on the corners of Main and Los Angeles, in the city’s beautiful Historic Downtown Old Bank District. The exhibition is within easy walking distance of The Standard Hotel, and driving distance of the beach. The show will be a vital source for art lovers, allowing them to discover new developments in contemporary art. A tour de force, LAAGAFBLA08 is the favorite summer meeting place for the international art world. Phantom Galleries L.A. presents the L.A. Art Girls Art Fair Biennale through Aug. 23 at the Pacific Electric Lofts. 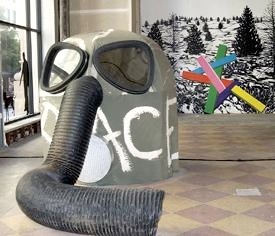 Claudia Parducci’s giant gas mask with the word “peace” painted on it is actually a miniature theater wherein visitors can watch a short video called “Breathless.” Elizabeth Tremante’s painting is in the background. Photo courtesy of Phantom Galleries L.A.
Phantom Galleries L.A. is no longer a wandering spirit. The gallery known for exhibiting art in vacant, raw, street-front spaces for as long as the property owner will have them – and then disappearing – now has a home at the Title Guarantee Building on Hill Street. Renee Petropoulos’ site-specific installation at the Fifth and Hill streets location, “Pershing Square/Title,” features printed and spoken words (broadcast onsite and accessible at 106.9 FM) exploring the architectural and social structures of Los Angeles. In August and September, the L.A. Center for Digital Art and Edgar Varela Fine Art will take turns curating exhibits for the space. But even with its permanent exhibition space, PGLA will continue to haunt vacant, street-level spaces in residential and commercial buildings with temporary art shows, as that is the whole idea behind the organization, modeled on a gallery of the same name in San Jose. “Phantom Galleries L.A. is essentially an economic development program for districts, properties, artists and arts organizations,” Simone said. Artists and curators get a venue, the property owners get press and foot traffic to the spaces they are trying to lease, and the community gets an extra dose of culture.